This is one of the simplest guides to guarding our tongue. 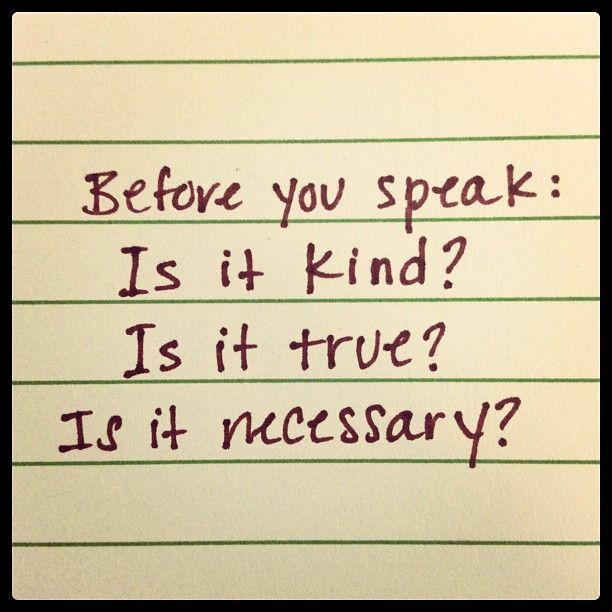 How hurtful careless words can be, from both sides. We speak a careless word and wound someone, or hear a word that cuts us deep. Many times offense was not the intent but was the result. And, as the poem addresses, you're telling someone else's story. Gossip, which someone has defined as, "Anything of a personal, intimate, or sensational nature, shared about another person without their express consent." At times I've thought if I could just keep my mouth shut, I wouldn't misspeak. However, silence is not always the answer. Sometimes the hurt comes out of silence which can be perceived as neglect, a lack of care, apathy, or intentional disregard. So I don't necessarily agree in every circumstance with Thumper's mom who taught him: "If you can't say somethin' nice, don't say nothin' at all." But "nice" (kind) is one of "The Three Gates." If we decide to speak, we must first measure it. Thinking, in advance, rather than just running off at the mouth whatever pops into our head. There are numerous attributions online as to who originated these gates, the earliest of which seems to be Socrates. Even the poem above has been mis-attributed to others. However, no matter the source, the gates and the accompanying poem are wise guides to follow. My wise colleague suggested we add one more. A fourth measure, also, a time-worn guide, which has helped me hold my tongue appropriately in several key places. Is this the right time and place to address this issue? Are these the people who need to hear what I'm wanting to express? I didn't understand that proverb for many years, I believe it simply means an appropriate word in the right setting is beautiful. It fits the situation, considers context and audience. and is crafted and delivered in a way which benefits the hearer. So, if it is true, and necessary, and kind, then plan when to speak this word, to the ones who are best to receive it. There was a young clerk who reported to me in an engineering firm where I supervised administrative staff. One workday we were having lunch at a nearby restaurant. He began to complain to me about his soup being cold. When the server came to check on us, she asked, "How is everything?" I expected him to send the soup back with a request to warm it, but he looked up at her with innocent eyes and said, "Fine!" Everything was fine? I was shocked. After the server left, my shock increased as my clerk began complaining again about the soup. I put my hand up in a "stop" motion and spoke a "timely" word. "If you are not going to tell the person who can actually solve your problem, then I don't want to hear your complaint." It might have been true that his soup was cold, but in grousing about it to me, he wasn't being kind to the server. Telling me wasn't necessary, because I couldn't do anything about it, and while venting might have given him some sense of relief or self-righteous vindication, it was unkind me as the listener. It's clear this gate-keeping analysis doesn't often happen before many words are spoken. Especially in our current climate of social media comments and debates. Everyone feels entitled to be heard, and considers their opinion as valid as the next. It takes maturity and discernment to understand that there are others who know a great deal more than we do about many things. And the ignorant won't benefit if you insist on correcting them. My young clerk took my rebuke to heart. It was a new concept that he had not yet encountered in his young life: to speak to the right person who can solve your issue, rather than talking about it ad nauseum to everyone else. "I realize even as I am writing that my memory is making much of very little," (to borrow a quote from Marilynne Robinson). "Making much of very little" could be the theme for almost every blog post ever written, including this one. I do consider these four gates when I'm writing paid articles and blog posts, and I've learned to take it seriously when I'm commenting on Facebook, Twitter, or Instagram. One careless remark, one errant tweet, these can destroy a life. Can I recommend you read the context of this verse by reading the closing paragraph of chapter 4 by clicking here. 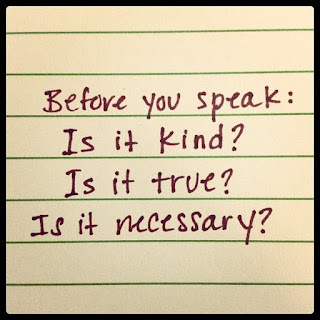 Speak truth, it says in v. 25; what is necessary, helpful and timely in v. 29, and above all, be kind, v. 32. The rest of the passage describes what is unhelpful. And "may the God of peace be with you."